Vermont's resort towns are thrilled with the timing of this latest winter storm, which made an already-busy holiday week even busier with visits from skiers, riders, and other visitors. The skating rink at the Stowe Mountain Resort's new Spruce Peak Pavilion drew a large crowd of visitors during Thursday's snow, including Tracey Morgan, from West Hartford, Connecticut. "We skied yesterday, we skied today, we were going to head back to Connecticut tomorrow, but we're thinking we're probably going to stay and ski tomorrow. It's beautiful," Morgan told necn. "With all the new snow, we'd be foolish to leave." Another traveler, Jesse Vidal of south Florida, said he had never seen snow before, until now. He was visiting a relative in Vermont. "People in Miami would be scared of this," Vidal said of Thursday's powdery snow. "I love it. When I first got here, first thing I did was take off my glove and touch it." Jason Hackwell, a property manager and plow truck operator servicing private homes and businesses in Stowe, was one of the many plow operators suddenly left with a lot of work on their hands. "We're going to be up all night," Hackwell told necn. 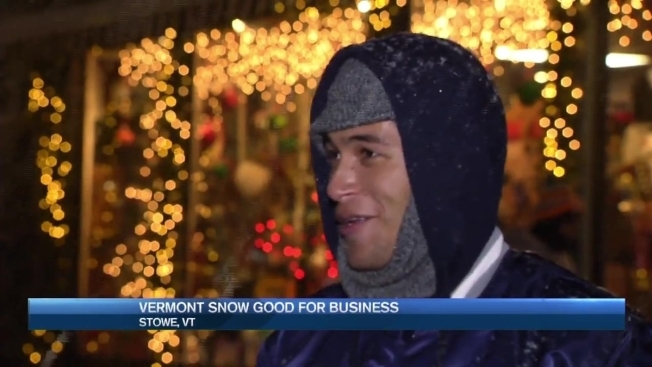 "In this town and in Vermont, snow is what makes the economy go. We all depend on it, and try to keep everybody open and moving and that's what we do!" While many people across Vermont had fun and were in good spirits in the snow Thursday, there were some significant problems on the roads. Vermont State Police reported several vehicle crashes and slide-offs during the snow storm, including one fatal crash in Addison County. Robert Fields, 69, of Orwell, was pronounced dead at Porter Hospital in Middlebury following a crash in Cornwall, police said. That crash is still under investigation, but police said it was snowing and roads were slippery at the time of the crash.